Pledge to Vote for Colonias! There are over 1,000 colonias in the Rio Grande Valley. Over 200,000 residents live in these unincorporated neighborhoods that lack basic infrastructure like streetlights and adequate drainage. Let’s begin changing that with our voices, and with our votes. We can make county officials pay attention to colonias if they see that lots of voters care about colonia issues like streetlights and drainage. Right now it looks like at least one county commissioner race will be decided by only around 1,000 votes. If those 1,000 voters say they care about colonias issues, don’t you think county commissioners will take note? Make your commitment to vote for colonias issues today! With a race as close as 1,000 votes, every voter has the opportunity to impact the positions of the candidates. If we can show the commissioners our voter pledge demonstrating 1,000 voters that care about colonia issues, you bet they are going to do what they can to show their support for colonias. And colonias will be able to influence the position of the commissioner, no matter who wins. Join your voice with colonia residents by making your commitment to vote for colonias today. Many of the over 76,000 colonia children waiting for the bus on their first day of school next week will be doing so in the dark. Without streetlights in their neighborhoods, colonia parents worry that their kids might get hurt while they wait for the bus, board the wrong bus, or be left by a bus that can’t see them waiting. Will you help us change that by sharing this image? Elda Gonzalez, resident of Tauros 14, announces the regional Public Light Campaign at last week’s Hidalgo County Commissioners Court meeting. The Public light Campaign is now in month three and progress has been made with over 3,000 individual petitions signed, and other community groups and churches continuing to sign on their support. Download the petition and ask your church, business or organization to sign. LUPE leaders, along with members of ARISE, TOP, and START, have organized to increase support in our communities. In our 1,000 colonias lacking streetlights we continue to have unsafe conditions and unacceptable number of preventable fatal accidents. Because of this, members have met with county officials over the past month to bring close attention to this issue. – After an 8 year campaign, won the installation of streetlights in 13 Hidalgo County colonias. Organizing with the Communities Creating Healthy Environments (CCHE) initiative of the Robert Wood Johnson Foundation, LUPE members worked with Hidalgo County Commissioners and their precinct staff to fund and install the first of what we hope will be many more streetlights to come. – With great joy and fighting spirit, around 800 members of LUPE and sister organizations marched through the streets of San Juan to celebrate the birthday of Cesar Chavez and, at the same time, the 50th anniversary of the founding of the United Farm Workers. In recognition of her 26 years organizing for improvements in her colonia and her tireless efforts to give a better life to those around her, LUPE leader Teresa Barrera received the honor of having a park named after her. The park, which was built in 2007 in the San Juan area colonia El Jay, will now carry the name of Doña Teresa and serve as a reminder to the community of what can be accomplished when we organize. 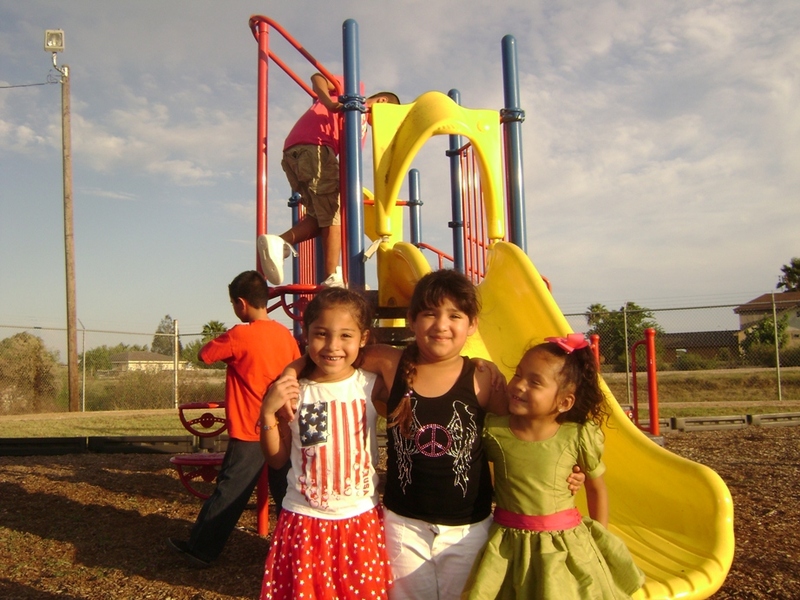 The park is only one of many improvements that Doña Teresa and the colonia El Jay committee achieved over years of organizing. When Doña Teresa and her husband Inocencio Barrera moved to the colonia in 1986, the neighborhood had nothing but lots and simple homes made from any material available. It had no running water or paved roads, and certainly not a park. She remembers telling her neighbors that even though she came from a poor ranch in poverty-stricken Mexico, even the ranch had better living conditions that her new neighborhood. From the start, Doña Teresa was animating her neighbors to speak up for the needs of the community. Doña Teresa Barrera (center) poses with family in front of park sign bearing her name. Now, after tireless years of organizing, the colonia benefits from paved roads, running water, streetlights, mailboxes, school bus stops, and even a park, an improvement that most colonia residents only hope for. Teresa Barrera Park was built in 2007 under the authority of Commissioner Tito Palacios when colonia El Jay pertained to County Precinct 2. This year, because of redistricting, colonia El Jay passed to Precinct 1. 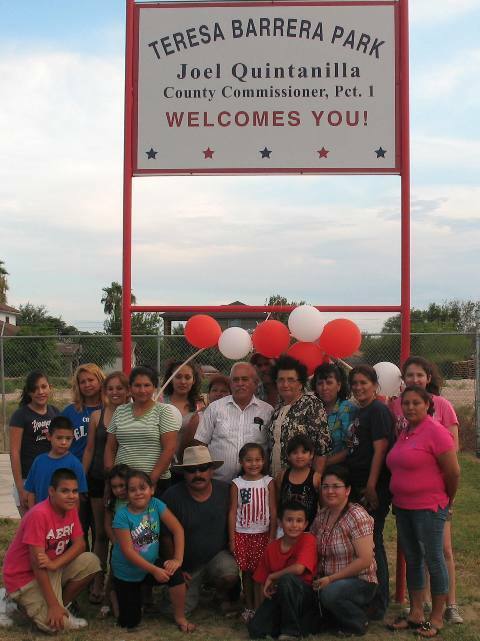 Commissioner Joel Quintanilla renamed the park in Doña Teresa’s honor. Colonia El Jay is an example of what is possible when we are persistent, work hard toward a goal, and above all organize together. ¡Sí Se Puede! We’re starting to see the light! – First round of streetlights to be installed this month! UPDATE: By the beginning of this month, all three precincts had completed installation of streetlights in the 13 colonias. We are celebrating these victories along with colonia residents. For pics from these celebrations, visit our facebook page. Colonia residents pose after winning a portion of Precinct 3 budget for installation of streetlights. This month, Precinct 3 is taking the important first step down the enlightened path toward justice for colonia residents. Starting January 23rd, colonia residents will see the first round of streetlights installed in five colonias, starting with colonia Pueblo de Palmas. LUPE residents worked with Precinct 3 Chief Administrator Dr. Mona Parra on the plan to install solar-powered streetlights in the five colonias north of Alton, including Pueblo de Palmas, Buena Vida, Mi Sueño, La Homa Meadows, and El Flaco. Precinct 3 found funds to purchase the lights via a federal grant and amended the county budget to pay for their installation. 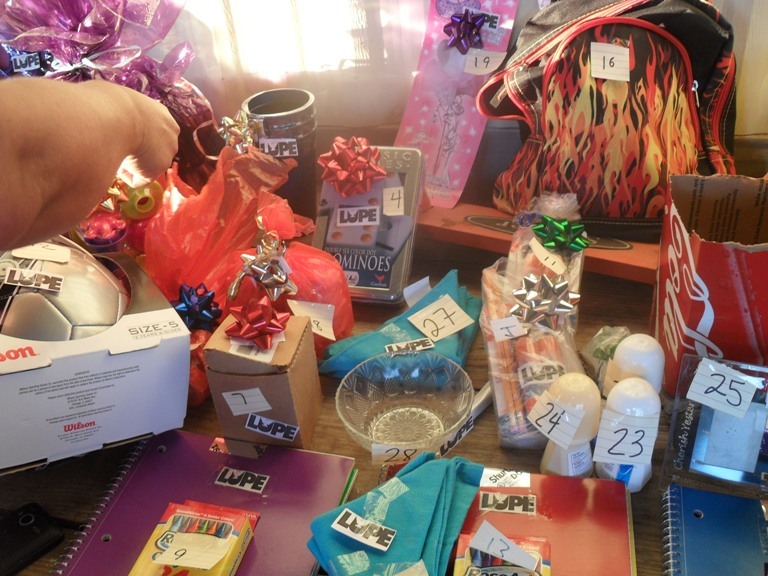 Prizes for bingo event at colonia Serenidad. The lotería night provided a way for more colonia residents to learn about the campaign for streetlights in the colonia. Residents of colonia Serenidad have lived in the dark for 14 years. But these days a small group of leaders have been on a roll working alongside LUPE towards positive change in their community. 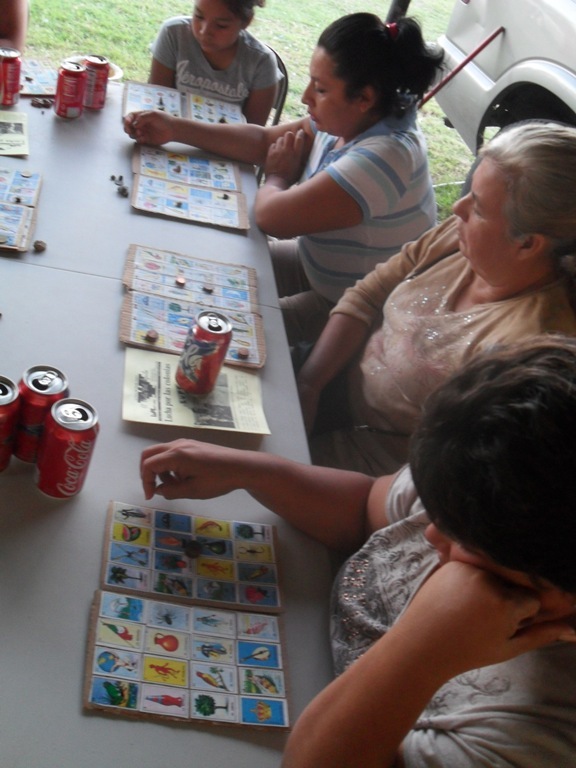 Earlier this month Serenidad organized a “lotería night” in an effort to encourage more neighbor participation in LUPE’s house meetings about public lighting. Serenidad is following in Buena Vida’s footsteps, a colonia in precinct 3 who recently organized a lunch date with Dr. Mona Parras, Assistant Chief to Commisioner Jose Flores, who has promised five streetlights in Buena Vida’s colonia come January. As house meetings in Serenidad grow in quantity, Mona Parras will be receiving invitations to attend meetings in the near future. Residents have made it clear that the plan to increase people power in their colonia has been initiated. Now is the time for precinct 3 to share the wealth and “turn on the switch” in their constituents’ communities. Founded in 1989 by labor rights activist César Chávez, La Unión del Pueblo Entero (LUPE) is committed to building stronger, healthier communities where people have the power to effect social change through community organizing and civic engagement. Please join our movement and consider making a donation today! Want our blog updates in your email? Visit the recently revamped lupenet.org! Texas Kaos: Take Texas Back! Petition for César Chávez Day! We can end 287(g) Programs NOW!